Summary and Definition: The Fox (Meskwaki) tribe were a fierce, warlike people who originally inhabited territory in the western Great Lakes region and then in Green Bay, Wisconsin. Chief Kiala led the tribe in a series of conflicts against the French in the Fox Wars (1712 - 1733). The tribe was so feared that King Louis XV of France ordered the complete annihilation of the Fox people. In 1734, that the Fox (Meskwaki) joined in a lasting alliance with the neighboring Sauk (Sac) tribe and extended westward beyond the Mississippi. The above picture depicts Kee-o-kuk, meaning the Watchful Fox, who was a distinguished chief who was acknowledged leader of the Sacs and Foxes by General Scott. It was painted by the famous artist George Catlin (1796-1872) at the Sauk and Fox village in 1835. What clothes did the Fox tribe wear? The picture of Kee-o-kuk depicts the type of clothing worn by the Fox warriors, the hairstyle and headdress, their decorations and some of their weapons. His hair is shaved to leave a scalp lock that was attached to a roach headdress that stood straight up from the head like a crest. The roach headdress was made of a stiff, thin strip of animal hair placed over the top of the head held open by comb-like object called a roach-spreader. The roach headdress was dyed red, and decorated with a feather. The Fox chief, like all warriors, wore war paint to intimidate their enemies. He wears a necklace of bear claws and his ears are pierced. His decorated collar displays his battle trophies in the form of small scalp locks taken from his enemies - refer to practise of Taking Scalps in Indian Warfare. His breech cloth is passed between his legs and attached to a cordage belt. He wears buckskin leggings and moccasins and caries a warm buffalo robe or blanket. His elaborate shield would have been used during horseback warfare and he carries a tomahawk that would have been used in hand-to-hand combat. What language did the Fox tribe speak? The Fox tribe spoke in a related dialect of the Algonquian language. The people belonged to different clans, based mainly on animals. The early French explorers and traders mistook one of the clan names, 'Wagosh' meaning fox, for that of the entire tribe and began mistakenly referring to them as the "Renard" the French for Fox, and the English and Americans continued the error in their own language. The Fox called themselves the 'Meskwaki' meaning "red earth people" in reference to their creation myth. 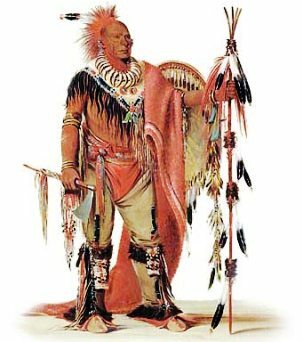 They were known to their enemies the Chippewa, and other Algonquian tribes, as 'Utugamig' meaning "people of the other shore". What was the lifestyle and culture of the Fox tribe? The Fox tribe were farmers, hunter-gatherers and fishermen who made excellent use of their swift, lightweight birchbark canoes. Originally living along the western Great Lakes they extended their lands into Wisconsin and further west where they hunted buffalo. The powerful Meskwaki tribe gained control of the Fox River system in eastern and central Wisconsin. which was vital for the colonial New France fur trade. The Fox tribe were the only Algonquin speaking people to fight a war with the French, who they regarded as staunch enemies due to trading disputes. The Fox also regarded the Chippewa French allies as their mortal enemies. The hostility between the Meskwaki and French erupted into a series of conflicts that became known as the Fox Wars (1712 - 1733) which were led by the Fox chief Chief Kiala. The violent conflict resulted in the lasting hatred of the French, who so feared the Fox tribe that King Louis XV of France ordered the complete destruction of the Meskwaki people. Their defeat in the Fox Wars led to the long standing alliance with the Sauk (Sac) tribe. Both the Fox and the Sauk people had a strong sense of tribal identity and each retained separate chiefs, customs and traditions. The Fox had three kinds of leader. The hereditary peace chief maintained peace within the tribe and was in charge at village council meetings. The ceremonial leader, or Shaman, was responsible for the spiritual well being of the people and for their religious ceremonies. The war chief was chosen for each military campaign based on his fighting skills and visions. The Fox became allies with the British during the French and Indian wars (1689 - 1763). The Fox tribe relocated southward from Wisconsin into Iowa, Illinois, and Missouri. Following the American Revolution an alliance of many different tribes, called the Western Confederacy, was formed who aimed to keep the Ohio River as a boundary between Native Indian lands and the United States. The Fox subsequently fought in Little Turtle�s War (1785�1795), Tecumseh's War (1811�1813) and the 1832 Black Hawk War. The Indian Removal Act of 1830 resulted in the Fox tribe being forcibly moved to reservations in Indian territory. Where did the Fox (Meskwaki) tribe live? The Fox are people of the Northeast Woodland Native American cultural group. The geography of the region in which they lived dictated the lifestyle and culture of the Fox tribe. What did the Fox tribe live in? The Fox tribe lived in two different shelters, the longhouse and the wigwam, a temporary shelter that was used by Algonquian speaking Native Indian tribes who lived in the woodland regions. The Fox longhouses were built from birch bark. The dark, windowless Longhouses had a rounded roof and doors at both ends and a smoke hole in the roof to let in air and light. The Fox wigwams were small cone-shaped houses with an arched roof made of wooden frames that are covered with woven mats and sheets of birchbark which are held in place by ropes or strips of wood. Some Fox wigwams were covered with buffalo hides, if this was a major resource in the area they lived in. A Wigwam was usually about 8-10 feet tall and 10 - 15 feet wide at the base. What food did the Fox tribe eat? The food that the Fox tribe ate depended on the natural resources that were available to them in the locations that they lived in. What weapons did the Fox use? The weapons used by the Fox warriors included bows and arrows, spears, lances, war clubs, tomahawks and knives. Fox History: What happened to the Fox tribe? The following Fox history timeline details facts, dates and famous landmarks of the people. The Fox timeline explains what happened to the people of their tribe. 1791: Battle of the Wabash on November 4, 1791. Chief Little Turtle and and Chief Blue Jacket led 1,000 warriors to a victory against Major General Arthur St. Clair's 1,400 federal troops. 1811: Tecumseh's War (1811�1813). The Fox join the Shawnee chief Tecumseh in an attempt to reclaim Indian lands.